Mr. Abner has the correct answer, with (almost) the correct explanation. 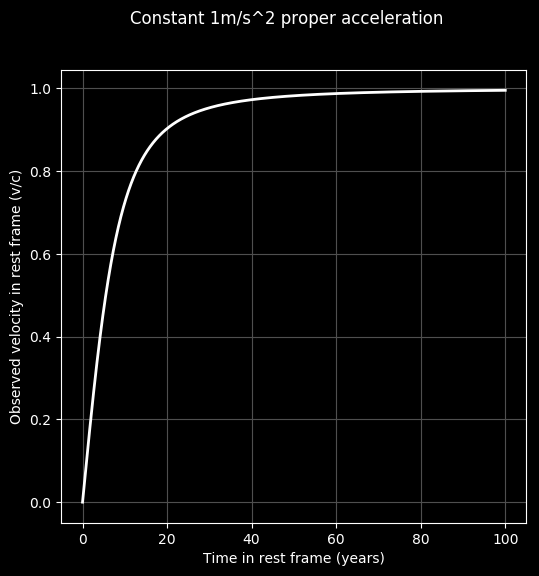 An object with constant acceleration in its frame of reference (what we call "proper acceleration") does not have constant acceleration as we see in the rest frame. The observed acceleration decreases as its speed approaches the speed of light, so it never actually reaches or exceeds the speed of light. It is tempting to say that this is because the object's mass increases, so that the same force provides less acceleration. But I recommend avoiding that temptation. In fact, applying it naively will lead to the wrong answers. Also, if there is an observer fixed to this accelerating object, that observer will say that the acceleration is constant. So this "relativistic mass" description does not actually explain what's happening between the two reference frames. It is better to say that the mass is invariant (it does not change with speed). What's actually happening is that space and time behave differently between these two frames. The observer fixed to the object will say that distances in the direction of motion become shorter (length contraction). They say the distance between the portals decreases. Observers in the rest frame have another explanation as well: they see that the accelerating clock ticks more slowly (time dilation). This is very different than what you would expect from intuitions. You might think that the velocities simply add together, like v = vrel + u' ( this is the 'Galilean' view of relativity). But they don't. They can't add in such a straightforward way, especially for large velocities, because the sum cannot exceed the speed of light. This is a situation where 1+1 does not equal 2. Example: If a spaceship is moving at 0.5c relative to us, and then it fires a bullet ahead of it, with a speed of 0.5c relative to the ship, then we observe the velocity of that bullet to be 0.8c. Not 1.0c. Ok, enough math. Let's make a graph to get some easier insight. This is the acceleration (a) that we measure, as a function of the velocity (v) that we measure, in the rest frame, assuming that the acceleration of the object in its frame (α) is constant at 1m/s2. 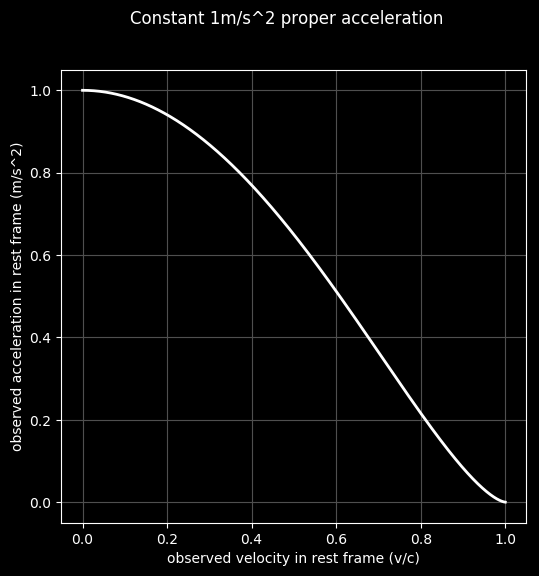 As its speed increases, the acceleration decreases, eventually to zero. The curve describing how this happens is interesting. From intuition I would have expected most of the decrease in acceleration to happen when v got very close to c, but it's more of a steady decline through intermediate speeds. After 100 years it is moving about a million m/s slower than light (about 99% of c). After 1000 years it is moving ten thousand m/s slower than light (99.99% of c). After 100,000 years it is moving barely 1m/s slower than light (99.999999% of c). 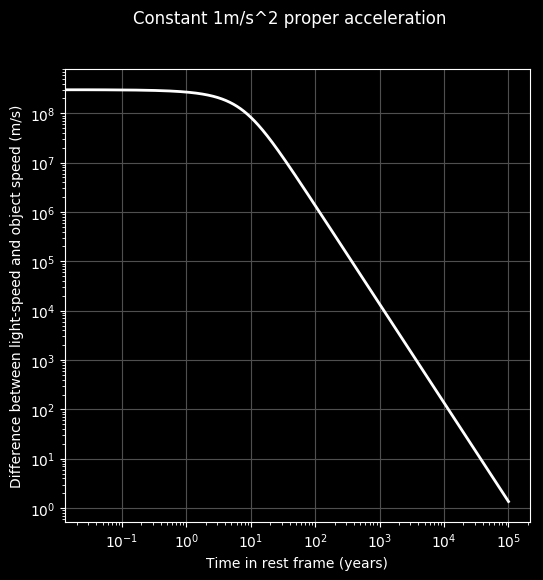 So it takes a long time for it to asymptote to the speed of light (1m/s2 proper acceleration isn't too quick). Yet the object does say that its acceleration is constant the whole time. I think this is pretty mind-bendy. Even when it is moving 1m/s slower than light, it says it is still speeding up by 1m/s per second. Yet it never reaches the speed of light. The speed of light is somehow always faster. Length contraction is also interesting in this case. The distance between the portals decreases. Eventually, it would even be shorter than the size of the object. This is problematic, as it implies the object eventually no longer fits between them. This is also weird, because in our frame we say that the distance between the portals is fine, and it is the object itself getting length contracted, so it should have no problem fitting. That's another classic "paradox" of special relativity, but resolving that one will have to wait for another time. Or if you want to go ahead and read about it, google the "Pole-Barn Paradox". Thank you very much for your answer, Watsisname! Also, the paradox that you mention in the end is very intriguing. Watsisname, Just... excellent, as always. You took some time to do the work and I only can appreciate that (I was going to answer in a very concise and probably not very illustrating manner but waiting for this was a better option). Slowly this thread is becoming a reference for some google searches thanks to you and that is awesome, first becuase you are educating people and second because you are making SE known into curious beings. So thanks again for the effort. pzampella, The question is also very interesting here. Portals might be impossible physics but I get the idea behind the example; would an object falling in a gravitational field archive faster-than-light speeds? If not, where is the gravitational potential energy going? Is kinetic energy even defined in the same way as in Newtonian terms? The problem stated does not need for portals and strange physics to be invoked (and that is what makes this even more interesting). Think about an infinite universe where only Earth and a rock are present. If you let the rock fall down to Earth from infinity it would accelerate until it crashes at a speed of around 11 km/s (the escape velocity of Earth). So you never get to light speed. But! On the event horizon of a black hole you "have" an escape velocity equal to the speed of light. So if your universe had only a rock and a black hole and you let the rock fall from infinity (starting from rest relative the black hole) then all the previous explanation from Watsisname would be similar. Nature does this without portals. The only thing that makes your version of the problem more easy to address is the fact that the acceleration of our rock changes with time while with your portals we can compute for a more or less constant acceleration. But yeah for the rock falling to a black hole all the above graphs would be the same except for a huge stretch in the x-axis at the first part of the plots (not so fancy and explanatory indeed). Watsisname, You even managed to create excitement with the next topic (simultaneity in relativity) in a very smooth way. I'm still learning the basics here (I will for many years after my Master thesis) but my prediction is that from the perspective of the observer at rest relative to the portals the act of "entering one of the portals and exiting the other instantaneously" just breaks. Also here, portals show a very strange situation that might show how absurd the idea of portals could really be. Let's define a portal here as a device that lets you transport instantaneously from one point in space to another. But what does instantaneous even mean? From which perspective? Let's have 3 frames here. M is the observer moving through the portals, A is a frame at rest with respect to the exit portal (the one farthest from the planet) and B is a frame at rest with respect to the entry portal (the one closer to the planet). Since we are assuming both portals to be at rest relative to one another we know that A is at rest from the perspective of B and B is at rest from A's perspective also. Great! So, in our definition of portal. What is instantaneous? From the perspective of M instantaneous transport means that there is a time t were the the object is located in two parts of the universe or even better there is a time t-dt were the oberver is located in one part of the universe and a time t+dt were it's located in another part. With portals we are breaking the continuous aspect of spacetime. I think this violates some of the ideas in special relativity since you would be able to access events outside your light-cone and therefore you could travel back in time (reversing causality) and also could be viewed as if you were traveling at infinite speed from one portal to the other. But let's play a little with the idea even if it is probably flawed. Even if we imagine the portals to be subject to the same gravitational field there still are some disturbing and subtle consequences. To explain this subtle effect erase the planet in this new scenario and think that the 1 m/s2 acceleration is now provided by the rockets of the spacecraft and not by the gravitational field of the planet. This would not make a difference for M since the equivalence principle (also from relativity) says that all the effects should be the same for a free-fall in the presence of a gravitational field or just by constant acceleration without a gravitational field (I hope to be correct with this, sometimes it's tricky), but it would make a difference for the portals since now they are not subjected to different gravitational forces or any at all and therefore time dilation due to gravity would not be experienced. Now, from A and B's perspective, both A and B have clocks that tick at the same time and in perfect sync, so portals could be defined as devices that are able to transport an object from one place to another instantaneously with respect to both A or B. Would this definition of portal be valid for the understanding of what is instantaneous for M? Would M think of A and B as true portals? This effect we are going to talk here (the break in simultaneity) does not need for an accelerating object so let's keep it simple. Suppose that M is moving relative to A or B (no difference in this choice) with constant speed. This is the inverse problem of Einstein's train. Any event happening at portal A at the same time as any event happening at portal B from the perspective of either A or B (like the object transiting through the portals) would not look simultaneous from the moving object in M. In fact from M's view point it would seem like he entered the portal and traveled back in time since time in A would lag behind time in B from this perspective. How much? It depends on the velocity of M (as every effect in special relativity we usually mention) but more importantly it depends on the separation between the portals. If the portals were at sufficiently greater separations M would see them as if they were at different eons of history and at the time of traversal of B we would travel back in time. The object would exit A even before it entered B. To make things weirder the separation between A and B is also relative to M's motion (as explained by Lorentz contraction). Since here the separation is small (I assume) the effect is very tiny. But, if I'm doing this correctly, the fact that the object crosses the portals many many times could accumulate this effect until it's noticeable (more so if we are close to the speed of light). This effect also happens in the scenario where we were dealing with the gravitational field of the planet but on top of it there was this gravitational time dilation thing affecting the portal clocks. So we have to take into account both things. Also we have to take into account acceleration (my last scenario was with constant speed) so we have to think about this "getting duplicated in time" effect as an increasingly strong effect. We may ask more or less the same question without having to use portals. If we're at a distance above the event horizon of a black hole and drop one bullet at fire another at great speed, would the fired bullet cross the event horizon at a greater speed? Though counter intuitive, no that's impossible. Then one might ask, well, since the first bullet will be in free-fall and feel no acceleration (disregarding tidal forces), then the fired bullet ought to feel some deceleration in order to match the other bullet's speed as they cross the horizon since they're both subject to the same gravitational? That can't be either. What if Theia had hit the earth and created 2 moons and they didn't merge together? How would things look for Earth? Watsisname, according to several of my uni teachers, the spectral distribution function is not integrable for definite bounds. Meaning, I cannot hope to form the integration using elementary functions. So at first, I approximated it for visible spectrum (390-700nm) by cutting the distribution function into rectangles and summing their surface area. The curve calculated using this method shows a 0.59 decrease in magnitude, compared to 0.25 through the entire EM spectrum. Using the V band sensitivity function you provided to further adjust the calculation, the magnitude drops by 0.655. This is as far as I can get using easy (relatively speaking) mathematics and it should be enough for the homework. However, I am interested in what is going on in depth. There is more that takes part in it. 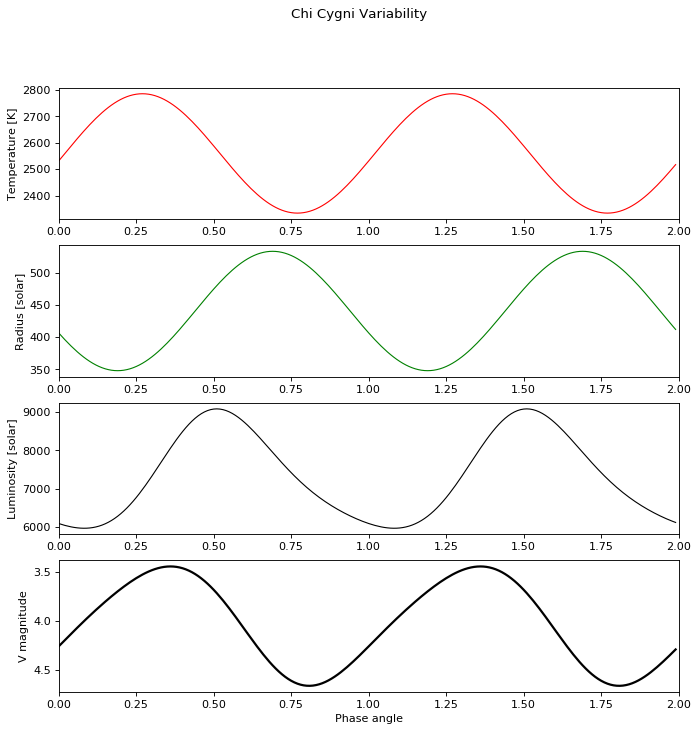 For example, spectrum of a star is not a perfect black body curve, which would definitely influence the apparent magnitude, but it is very close to it. Giant stars also lose material in stellar winds, which leaves gas/plasma in vicinity. It may be far-fetched, but do variable stars create an opaque envelope of some sort? Or are colder stellar photospheres enriched with molecules, which may contribute to the opacity? Brown dwarfs contain molecular gas, their low temperatures allow so. I also calculated it for the B-band, and as expected the magnitude difference is a bit greater there -- about 1.6 magnitudes. But still a far cry from the 8+ magnitudes required. For explaining the rest of the variability, I think you may be right that it could have a lot to do with opacity. Cool AGB stars do have a number of molecular species in their atmospheres. Lacour et al also discuss the presence of these molecular layers around Chi Cygni and the difficulty of distinguishing the effects of temperature and opacity on the brightness. Unfortunately I'm not an expert on this subject, so I can't be quantitative on how big this effect is. If you want to study it in more detail your best bet may be to check through some articles on Mira variables. I think you've done a great job so far though for modelling the effect of temperature and radius pulsations on the luminosity of the star. Nice work! Added: It is very interesting to see this phase shift between the v-magnitude and the luminosity. The brightest v magnitude happens before the peak luminosity, precisely because the spectrum is shifted more into the visible range at higher temperature. So the spectral distribution definitely does play a key role in what we're observing -- it just may be more for the phase than the amplitude. Watsisname, there is probably no error in your equations. I used 10 nanometres wide rectangles, but the difference should be negligible. The thing is, that our specifics for the variable star itself differ. 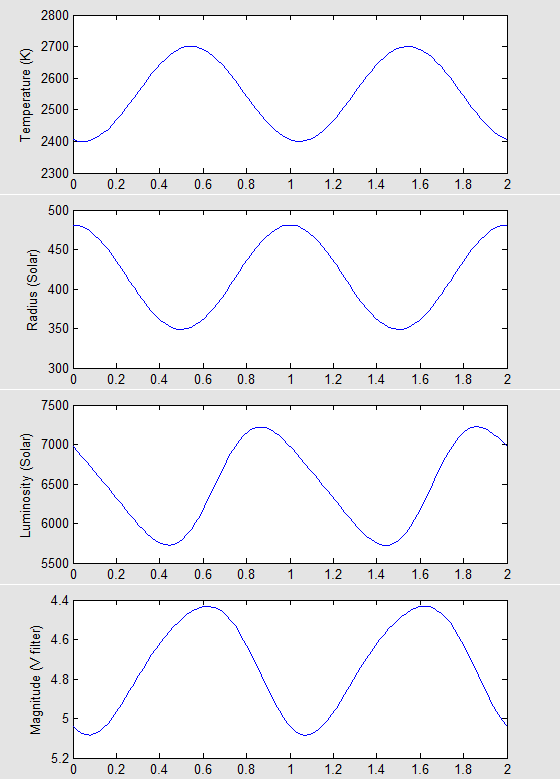 My temperature waves between 2400 and 2700 K and radius goes from 349 to 481 Solar radii (Wikipedia is not always reliable, I may add). This causes much shallower total luminosity changes, therefore, not so deep magnitude variability in the end. Haha, I can definitely understand wanting to have it looked at, after spending that much time working on it. Our radius and temperature curves definitely explain the differences. I wasn't expecting us to be using different data (or for the data to be that different). In my case I used the sinusoidal fits given in Table 7 of Lacour et al (2009), in order to reproduce Figure 9. This is also the basis for the wikipedia graphic. I did have to also choose a value for the distance (170pc), though since the radius curve was given in terms of angle, changing the distance would affect the physical radius (solar units) and luminosity, but not the apparent magnitude. Assuming something like the Alcubierre drive, if one flew by Earth would it produce gravitational waves and be detectable even though it is moving FTL? Many processes like, for example, shadows are a consequence of other processes and might have an "apparent motion" that is greater than speed of light. The "motion" caused by an Alcubierre drive would not be an actual motion but rather an apparent motion cased by the contraption/expansion of space. But in case gravitational waves works like the atmosphere of a planet, you might be able to "break the gravity barrier" and, from that point on, you won't detect gravitational waves like you can't hear a plane going faster than the speed of sound. You would, indeed, detect if any object is traveling faster than light using this method, you would see a sonic boom-like explosion that would be similar to the merge of two black holes. It would be interesting to guess how it would look like, just to mentally test if this thing is possible or not! Normally an object moving in a straight line at constant speed does not emit any gravitational waves. But this case may be different because of its faster-than-light nature. Just as a charged particle moving faster than the speed of light in a medium emits Cherenkov radiation, mass moving faster than c would emit a gravitational analogue. but I did find a very recent paper about it here if you're interested. There is also the question of whether this situation counts, since like Salvo says the mass of the ship is itself not moving faster than c through its local patch of space-time. But I think the warp buble itself relative to the surrounding flat space-time should involve a similar kind of de-coupling of the field which would propagate outward. Salvo, the problem here is, while you are correct that it is not actually moving faster than c, the space distortion is carrying it faster than c and the question is in regards really to the distortion. Watsisname, an interesting paper but not quite what I was wondering. That is the bit I am curious about. I don't know how the expanding section of the bubble would behave, but the front of the bubble is a fluctuating highly disturbed region, a black hole in a sense without a singularity. So what I am wondering is if one flew by Earth, would our gravity wave detectors detect this disturbance, or given the small size of a warp bubble combined with how local those curvatures are would it be imperceptible? I have no idea. But if an FTL ship passing Earth emits gravitational waves strong enough for our facilities to detect, it would be radiating so much power that it sounds like a very inefficient way to travel. Has the Milky-way ever been or ever will be considered a Quasar? Is any galaxy with enough activity at its center labeled as a Quasar, and do they oscillate between the two definitions over enough time? Why is it we only see Quasars at extremely far distances (long ago)? Have we witnessed one flare up like we see Supernova happen? Scientist have been watching a cloud of gas called G2 roughly three times the size of earth near our galactic center and the four-million-solar-mass Black Hole hanging out there, hoping to see some x-ray activity when it is eaten. It is claimed by some that the Milky-way indeed went through a period of Quasar activity ancient humans witnessed only 10,000 years ago. 6 million years ago the activity created a shock wave of gas, moving at 2 million miles per hour, that has now crossed 20,000 light-years of space. They say that event left behind a million-degree gaseous fog, a sort of “bubble” that extends from the Milky Way’s core two-thirds of the way to Earth. It’s this “bubble” that the astronomers say they’ve now observed, via data from an X-ray spacecraft. Also, are these "bubbles" of pressure created by the gas responsible for the creation of arms in a spiral galaxy? Kind of like tree-rings, multiple arms might mean multiple Quasar stages or periods of time?